Melasma is a condition where dark patches are seen on the skin with little sun exposure. The most commonly affected areas are the forehead, cheeks, and upper lip. The cause of melasma is an internal change in hormones which makes the skin more sensitive to the sun. The response is similar to a suntan, but it is in limited areas and occurs with minimal sun exposure. In melasma, the skin produces excessive pigment which is deposited in different layers of the skin. One of the most common questions people ask is if thre is a cure for melasma. Unfortunately, melasma is a condition that we control, not cure. 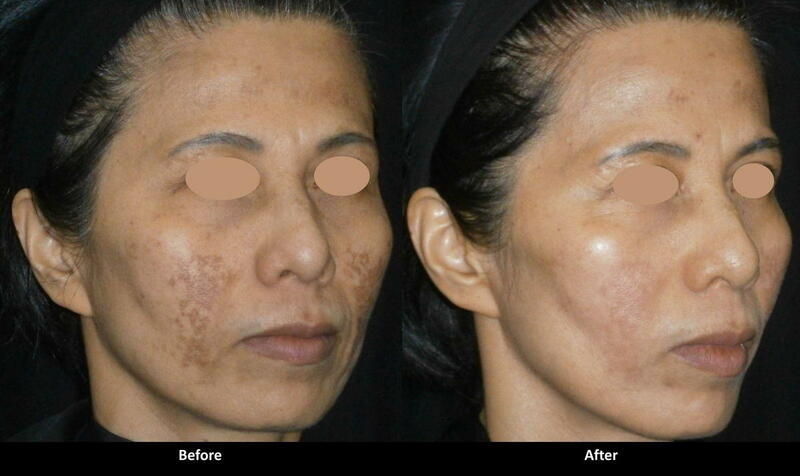 Treatment of melasma is easier when the pigment is closer to the surface. With deeper melasma, deeper treatments such as fractional resurfacing are required. A combination approach works best. It starts with a good skin care regimen including a sunscreen, brightening cream, exfoliant, and antioxidant. After several weeks of the regimen, the skin will be prepared for treatments such as photofacials, chemical peels, and laser resurfacing. Sometimes the dark patches get darker as the pigment rises to the surface of the skin after these treatments. But this is temporary and will improve with further product use and treatments. The most difficult part of melasma is that patience is required for good results and since the problem is internal, results are non permanent and maintenance treatments are required every three to six months. Contact us for a free consultation with Dr. Alex.